Did you know, Bill Gates was in his second year of college at Harvard, when he and his partner Paul Allen launched their own computer software company? Throughout their years at Lakeside School, Bill Gates and Paul Allen spent as much time as they could working on computers, becoming good friends in the process. It was the beginning of a lifelong partnership, eventually to become one of the biggest successes in the history of American business. Their company's impact has been such that the name 'Microsoft' has become virtually synonymous with computer software. 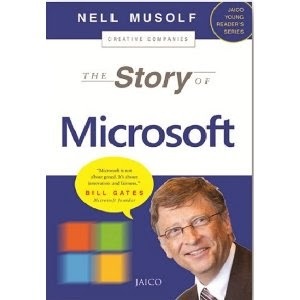 We bring you the story about the origins, leaders, growth and products of Microsoft, the computer software company that was founded in 1975 and gave the world, among a range of products, the Windows operating systems, the MS Word processor, the mouse, MSN and the Internet Explorer. Jaico's creative companies series explores how today's great companies operate and inspires young readers to become the entrepreneurs and businessmen of tomorrow.